The ancestry of every county in the US in one map. Surprising. Germany predominates? The coast of Pakistan had a 7.8 earthquake Monday. Half an hour late in the town of Gwadar people were astonished to see something in the ocean - an island. It is less than 300 feet long and sticks up 50 feet. Brave souls have already landed on it and walked around. Watch the bird migration at night. The weather radar that detects rain can also detect birds. When there is no precipitation the operators set the radar in a very sensitive mode that detects birds. I don't know how to directly access the radar. But Cliff Mass of U of W captured the bird activity on Saturday, September 7. The birds mostly fly at night to avoid predators. He has a series of radar captures from the new Langley Hill radar near Ocean Shores, Washington, showing little activity before sunset, heavy activity at night, then a sharp drop at sunrise. Cliff Mass describes this at his CM Weather Blog. Here are a radar image before sunset and one only an hour later, after sunset. It's amazing the leap in activity. Images from Cliff Mass. An official of the U Cal San Francisco medical school says that "nonbelievers" in Obamacare should be denied medical care. Stephanie Handler is in the development office of UCSF. She cannot handle policy disagreement, because this is war for her. How does UC President Janet Napolitano feel about her employee's action? A recent employee of William J. Clinton Foundation has been arrested in Egypt for inciting violence. But don't worry. Working for Clinton didn't cause him to be this way. He was a jihadist before Clinton hired him. Why did Bill Clinton hire a Muslim jihadist to represent him? Andrew C McCarthy at PJ Media explains. Before emerging as a top Brotherhood official and adviser to Morsi, el-Haddad served for five years as a top official at the Clinton Foundation, a nonprofit group founded by former President Bill Clinton. The Queen Anne neighborhood of Seattle is up and down from sea level to 456 feet in a compact area just north of Seattle Center and the Space Needle. Neighbors have built a web page of the 121 public stairs. QA Public Stairs. It is very well done. Today they are going to raise the Costa Concordia that sank off Giglio Island, Italy, after hitting rocks when passing close for the captain to show off in January, 2012. Telegraph (UK) has detailed sketches of how they are doing it. Needless to say, their process is very elaborate, since the ship is 950 long and is 114,000 tonnes - twice the size of Titanic. More after the first day's effort. Daily Mail (UK). Work on the tunnel in Seattle to replace the ugly Alaska Way Viaduct (elevated) is stopped. Big Bertha, the huge drilling machine, is idle; it hasn't moved one foot in over two weeks. Three? It is some union battle over dirt that is near water. How much is it costing every day? Who is paying the bill? I called my three legislators. I got two courteous promises to investigate and get back to me and one never-responded-to message. The courteous "get back to you" calls have never come, despite several days and follow-up calls from me. I called Governor Inslee and was told "He is working with the key parties, buts I can't tell you anything." Q: How much is it costing per day? A: Ask Office of Financial Management (OFM). OFM: How much does it cost? Ask Labor Relations. Labor Relations: Why would anyone send you to us about costs? Call Dept of Transportation (DOT). DOT: Call the Seattle project office. Seattle office: Voice mail. So after several days, no one has any idea about how much it is costing us taxpayers. Seattle Times about the source of the dispute. … The ILWU signed a contract in April with tunneling firms that included the four waterfront jobs, but an arbitrator said in July the building-trades pact takes precedence. Testimony at the NLRB resumes Tuesday. The record will be forwarded to Washington, D.C., where the five-member board would issue a ruling within weeks, said regional director Ronald Hooks. The board will be urged to act promptly, because of the stoppage, he said. Between 20 and 30 longshoremen a day have walked the picket line at T-46, said Cam Williams, president of ILWU Local 19 in Seattle. Why didn't the unions accept the decision of the arbitrator? Conrad Black looks over the record in elected office of Eliot Spitzer, who resigned in disgrace as Governor of NY. As New York's Attorney General he harassed innocent people and caused them great expense and ruined careers. He lost the big cases; they had little merit. And, even today, he is resisting the release of his emails; he has a lot to hide. Good news. He was rejected Tuesday in his bid for a renewal. The voters of NY City rejected him for the office of controller. The liberal establishment Huffington Post asks the question! Ariana's crew is way, way off the farm. The US has dropped since the last report during President George W Bush's term. And Eric Zuess at Huffington has several more sources. Read it. Hat tip to American Thinker. … In an August 29 letter to AFL-CIO President Richard Trumka, ILWU President Robert McEllrath cited quite a list of grievances as reasons for the disillusion of their affiliation, but prominent among them was the AFL-CIO's support of Obamare. "We feel the Federation has done a great disservice to the labor movement and all working people by going along to get along," McEllrath wrote in the letter to Trumka. The ILWU President made it clear they are for a single-payer, nationalized healthcare policy and are upset with the AFL-CIO for going along with Obama on the confiscatory tax on their "Cadillac" healthcare plan. The Longshoreman leader said, "President Obama ran on a platform that he would not tax medical plans and at the 2009 AFL-CIO Convention, you stated that labor would not stand for a tax on our benefits." But, regardless of that promise, the President has pushed for just such a tax and Trumka and the AFL-CIO bowed to political pressure lining up behind Obama's tax on those plans. Mark Steyn observes that ten years ago the Muslims objected to saying anything less than full praise about Islam. Now the British establishment is doing their work. Chilling. The Palestinian Authority paid cash to convicted terrorists recently released from Israeli prisons. The same day the PA received $148 million from the US. So we know where PA got the cash. We are paying bombers who target civilians. Why? ge - This generates a warning message. Select either standard or high-def, then you see a larger window. Hawaii Volcanos NP - active, very active volcano. Today it looks amazing at night. This is for my own daily convenience. Recreated 9/5/13. You know what you said, Mr. President. Everyone knows of your red-line challenge. What do we call it when you say you didn't do what everyone knows you did? Of course you can see sunken ships on Google Earth and Maps. But you have to know where they are? 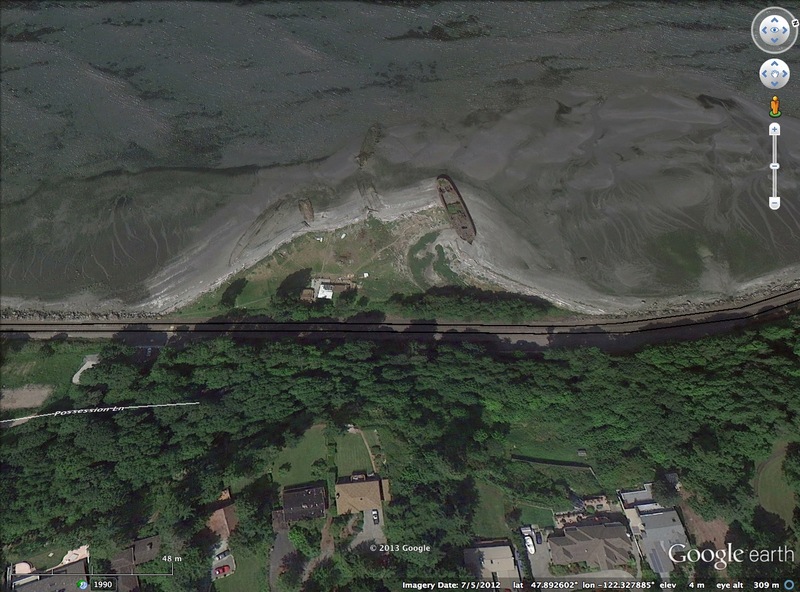 First, here is the Google Earth image of one that I am going to walk past today on my epic walk of every foot of beach from Seattle past Shoreline, past Edmonds, past Lynnwood and now finishing Mukilteo. It is in the Harbor Pointe area of Mukilteo. 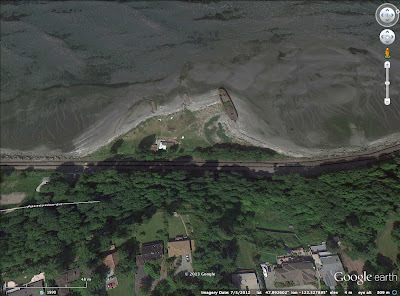 MyReadingMapped has several long lists of sunken ships with links to the location in Google Maps. And for fun they note which ones can be seen. This page is their first of two pages on singings in the Atlantic and shows hundreds. I can spend hours on this; love it! Image: Captured by me at Google Earth. Described in text. Click to enlarge.